Palladium Games was chiefly a presence in the tabletop role-playing games during the 1980s and 1990s. Their main super-hero game was Heroes Unlimited, though the licensed Teenage Mutant Ninja Turtles game should also be mentioned. The mechanics were awful, but the younger players tend not to care. And the book had some qualities, such as the art. Here’s an easy-to-use baddie from those books, for nostalgia’s sake. The Electrocutioner is an electrically-powered villain, which also gives him an healing factor . He tends to stick to shooting lightning at his opponents, rather than attempt more complex manoeuvres. Jimmy Kaatz was sentenced to death in Florida for the cold-blooded murder of an elderly couple during a mugging. However, during his execution on an electric chair, there was an accident at the generator due to a lightning storm. Kaatz was seemingly completely incinerated in the surge. He woke up outside the prison. After some disorientation he stole clothes, a car, and fled like mad. Only later did he discover his powers. He resurfaced as the Electrocutioner and has wreaked havoc in several mid-western states. He’s wanted by the law for several bank robberies and is known to have killed one police officer, and injured a dozen others. There is also a mob contract on him, as he was foolish enough to rob two of their casinos in Las Vegas. Underneath the hood, Kaatz has dark, greasy eyes and beady eyes. He’s a professional criminal, specializing in bank and casino robbery and other high-stakes thefts. He’s tough, mean, outspoken and rude – a thoroughly unsavoury person. He hates all authority figures, especially police and “those pansy super-heroes”. He loves money and enjoys a good fight. By Sébastien Andrivet adapting a Kevin Siembieda™© character. 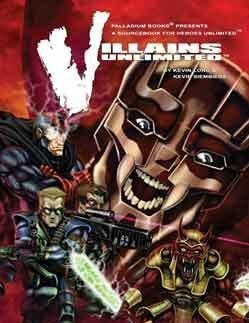 Source of Character: Villains unlimited sourcebook (Palladium universe).